Hint: Click on any image to open a full size preview. Let’s look at the Tool Tips feature. There are real tool tips that show you what a Tool Bar Icon does. Like this Regenerate or Screen to Machine tool tip. The more useful Tool Tips aren’t really tool tips at all but more like mini information tips or overlapping item selector aids. 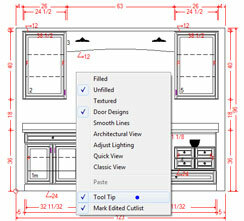 Turn the ‘Tool Tip’ on the Floor Plan view by selecting it from the <RB> menu. Now when you hover over an item, a box appears that shows you some information. Here is a wall tip. And a base cabinet tip. 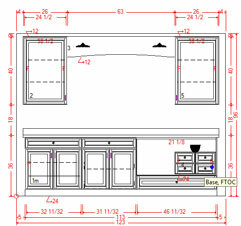 And two cabinets that are under the cursor tip. Where the tip comes in particularly handy is as follows; when it’s ambiguous as to what you are pointing at, it offers a way to select the desired item. 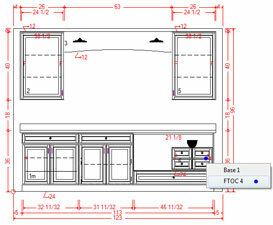 In this case you can highlight the Upper but not the Base or FTOC which are occupying the same floor space. You can select either the base or the FTOC to modify from the list. On the elevation it works similarly. Select Tool Tip from the <RB> menu while on the elevation. The base and FTOC occupy the same wall space in elevation so it’s hard to isolate the FTOC in the base without the Tool Tip on. Select the FTOC to highlight. The Tool Tip feature is very useful for allowing you to select items that are inside of others, such as 3D Objects in a cabinet or embedded cabinets. As an aside, there can be a jiggling effect when using tool tips on a standard elevation. This is a graphic effect that is controlled by a default setting in Windows 7 or Vista. 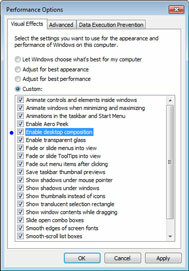 To eliminate the jiggling, set the Performance Option, ‘Enable Desktop Composition’ ON. **This Tech Tip is valid for all Cabnetware layout programs. V 8.2 or above.